Vlaar International Physical Therapy, inc. - TechniquesFirst and foremost, I am trained in physical therapy, I have studied the techniques mentioned below to complement my skills and improve effectiveness.Although you can request a specific technique, clinically, I have seen better outcomes switching back and forth depending on what your body needs.Optimal health relies on a harmonious relationship between the different systems of the body, the nervous system, the organs, the craniosacral system, the surrounding fascia and circulation.I am one of the few clinicians that have the skills to treat all these systems and thus optimizing the body's ability to optimize its own self corrective capabilities. Additionally, mobilization with movement provides immediate feedback. Specific pressure/assistance is applied and you will move further with less pain when we are at the right spot.Repetition will then reeducate your body.The same goes for kinesiotaping. When applied correctly, you will immediately notice an improvement. First and foremost, I am trained in physical therapy, I have studied the techniques mentioned below to complement my skills and improve effectiveness. Although you can request a specific technique, clinically, I have seen better outcomes switching back and forth depending on what your body needs. Optimal health relies on a harmonious relationship between the different systems of the body, the nervous system, the organs, the craniosacral system, the surrounding fascia and circulation. I am one of the few clinicians that have the skills to treat all these systems and thus optimizing the body's ability to optimize its own self corrective capabilities. Additionally, mobilization with movement provides immediate feedback. Specific pressure/assistance is applied and you will move further with less pain when we are at the right spot. Repetition will then reeducate your body. The same goes for kinesiotaping. When applied correctly, you will immediately notice an improvement. CranioSacral Therapy was developed by Dr. John Upledger, DO OMM, combining his osteopathic training with very gentle hands on techniques. The difference with other manual techniques, is that CST works from the inside out, affecting the immediate environment of the central nervous system. As a result, your entire body will be more in balance and move easier, leading to less pain and improved motion. It is a profoundly effective treatment, a gentle hands-on method that works with the systems of the body to facilitate the body's natural healing. It is a whole body treatment approach that treats dysfunction by addressing restrictions wherever they are located. The key to succes is treating each person as the individual that they are, as opposed to treating people as only a diagnosis. The myofascial release that I'm trained in is developed by John Barnes, PT. It specifically addresses the fascia, a 3-dimensional "tissue" that runs uninterrupted throughout your body to support, separate and protect your different body parts. When it is injured, as canl happen in physical or emotional trauma, repetetive overuse and poor posture, fascia will thicken and form cross fibers, become less fluid and decreases your ability to move freely and without pain. 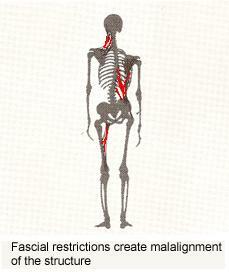 Left untreated, these restrictions have a tendency to become stiffer and tighter and pull you out of alignment. When this happens you cannot perform optimally and can experience pain, weakness and loss of mobility. Through MFR these restrictions are identified and gently released to allow your body to return to its natural grace and fluidity of movement. 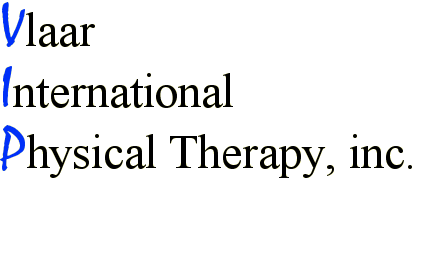 Visceral Manipulation was developed by French Osteopath, Jean-Pierre Barral. At optimal health, the relationship between the organs (viscera) and structures of the body (muscles, membranes, fasciae and bones) remains stable despite the body’s endless varieties of motion. But when one organ can’t move in harmony with its surrounding viscera due to abnormal tone, adhesions or displacement, it works against all the body’s organs and structures. This disharmony creates fixed, abnormal points of tension that the body is forced to move around. That chronic irritation, in turn, paves the way for disease and dysfunction. In order for the body to be healthy and function properly, the nervous system has to be able to move freely within its surroundings. As with other tissues and systems within the body, when the nervous system becomes dysfunctional it will cause the body to protect or compensate to help that area. This dysfunction will also hinder the body's self corrective capabilities, making it tougher for the body to find it's optimal health through equilibrium. Brian Mulligan's Mobilization with Movement is a very effective mobilization technique that helps quickly restore painfree motion and is very safe. What is unique about Brian Mulligan's approach, is that you will be treated in a weight bearing position which allows for immediate feedback. In other words, you will immediately notice that you can move further, that you have less pain , or both. kinesiotaping was developed by Dr. Kenzo Kase. Kinesiotape is a very comfortable elastic tape that you can wear for days at a time. You can shower and even swim with it. Depending to how it is applied, it can be used to decrease pain, improve circulation, increase or decrease muscle tone, provide support for your joints and improved proprioception so that you move better. 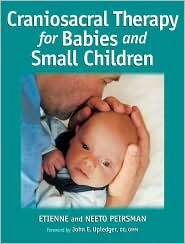 "The inner wisdom of a fetus and an infant is every bit as intelligent as that of an adult. It knows what its body needs to correct its dysfunctions. It knows why those dysfunction are present. It has a softer voice that the adult inner wisdom. Therefore, the craniosacral therapist must learn to listen more carefully. Once the connection is made, all the information you need will be forthcoming"
-John E. Upledger, D.O., O.M.M.